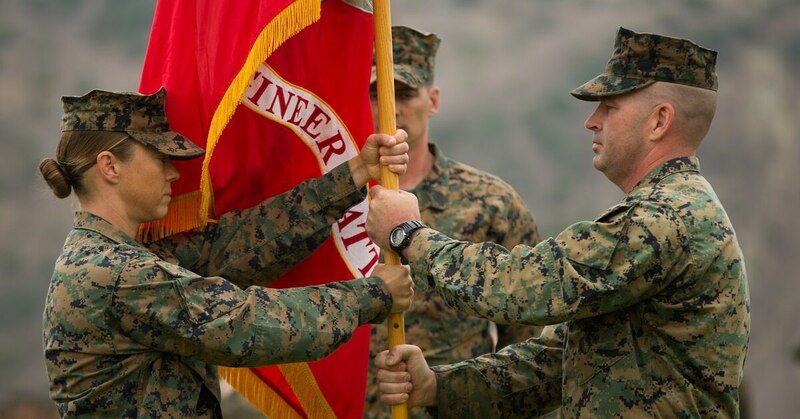 A historic change of command took place June 22 aboard Camp Pendleton, California, as the first woman to command a Marine ground combat arms unit took charge. Lt. Col. Michelle I. Macander took over as commanding officer of 1st Combat Engineer Battalion, 1st Marine Division from Lt. Col. Christopher M. Haar, during a ceremony held aboard Camp Pendleton. Macander is now the first female Marine to command a ground combat arms unit. The Corps has slowly been making progress in gender integration across the combat arms as female Marines begin to fill out jobs and units that were previously closed to women. Roughly 30 Marines were dropped from the course, which includes two other female Marines. Marine Corps Times reported in early March that there were about 10 female officers serving as 1302s or combat engineer officers, and there were about 16 1371s, or enlisted combat engineers. Only one woman thus far has graduated from the arduous 13-week Infantry Officer Course aboard Quantico, Virginia, while another is on track to graduate.